After a weekend out of town and then one thing after another, I didn’t even make it to the grocery store until Thursday of this week. By the time Wednesday night rolled around, I was dying to cook something. Somehow I ended up making three photo-worthy dinners by Friday night, so I thought I would share. I’ll include all the recipes near the end. 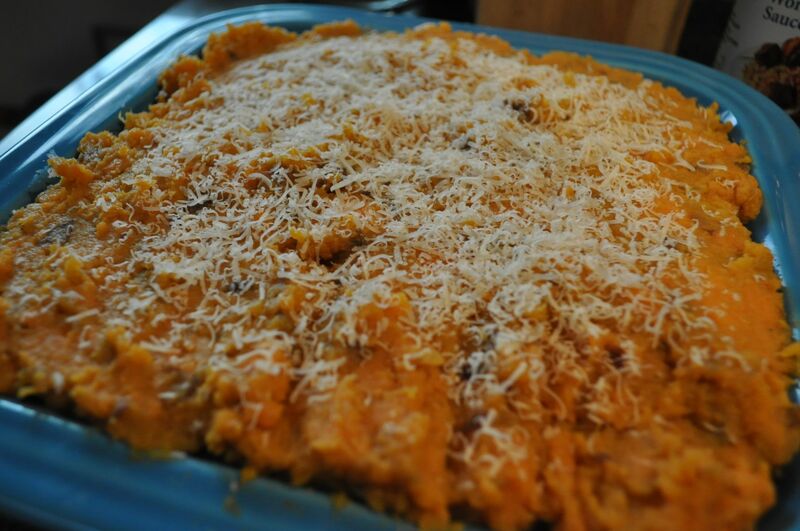 Shepherd’s Pie with Turkey and Sweet Potatoes. You can do this layered dish several ways, adding cream or cream of mushroom to make it more decadent, or adding a little milk to the sweet potatoes and worcestershire to the meat. The best part is you can use almost any mix of vegetables, though I’d say onion, carrots and peas are a good foundation (even if you accidentally buy snap instead of shelling peas, like I did, just throw the whole thing in). 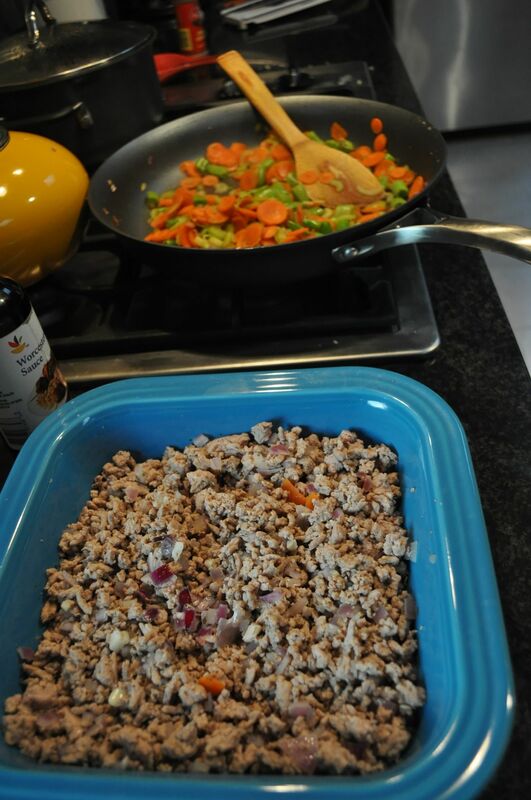 I would suggest basically never buying the extra lean ground turkey — it turns out way too dry in almost any recipe. You’re already using turkey instead of beef, so give yourself some flavor. Place sweet potatoes in a pot and cover with water. Bring water to a boil and then cook potatoes about 15 minutes, until mushy when poked with a fork (err on the side of overcooking to avoid hard chunks). Once cooked, mash the sweet potatoes and add milk or cream until thin enough to spread. Season potatoes with salt and pepper. Add a dab of butter for smoothness. In a skillet or Dutch oven, heat the oil and add the meat, breaking it up with a spoon to brown it thoroughly. Season with salt, pepper, parsley and other spices in the herbs de provence category. Move cooked meat to your casserole dish and sprinkle worcestershire sauce and half of the chicken stock on top for added moisture. Add a little more oil to the pan. Add garlic, onion, carrots, peas, celery and other vegetables (mushrooms are always good, too) and cook until onions translucent. Layer vegetables on top of meat in the casserole. Add more chicken stock at this layer, without making it too soupy. Layer and smooth the sweet potato mixture on top. Top with grated parmesan cheese. Put the casserole in the oven for 5 to 7 minutes to brown the cheese and warm things up. Slice and serve like lasagna! Grilled Cheese and Tomato Soup! I had planned to make the bread in my bread maker, but I couldn’t find rye flour and had my heart set on that signature taste. I found a perfect-sized packet of thin rye bread at TJ’s, along with the requisite fancy shmancy cheese that raises grilled cheese to the gourmet level (see the October Bon Appétit for their renditions of GCs for a crowd.) 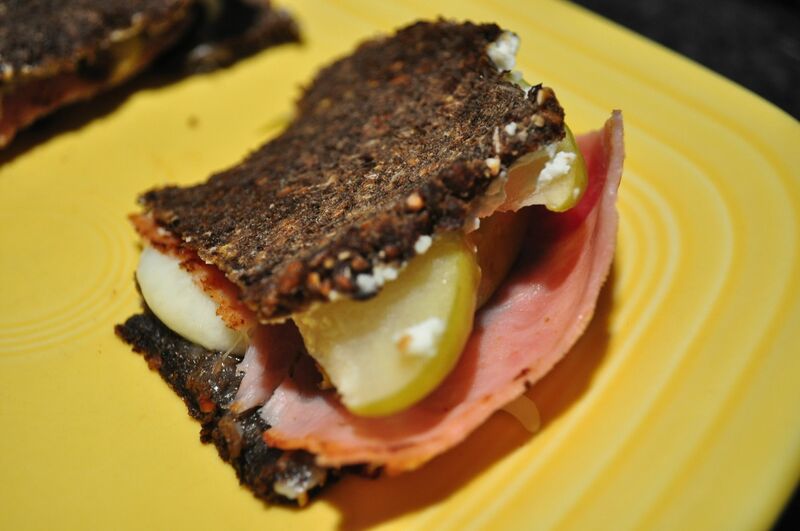 I went with a spread of goat cheese on rye bread, topped with pan-seared green apple and ham slices. And a sprinkling of mozzarella on top for more cheesiness. It was pretty amazing. I also made a less creamy version of the Creamy Tomato Soup out of Bon Appetit’s magazine. I added a little half-and-half and milk instead of cream, and I didn’t feel like spooning the whole thing into my silly blender (hand blender is on the Christmas wish list), so I used a meat masher to roughly chop up the whole tomatoes. My husband, who usually only likes tomatoes in the form of ketchup or pizza sauce, liked it. Better than Campbell’s, he said. 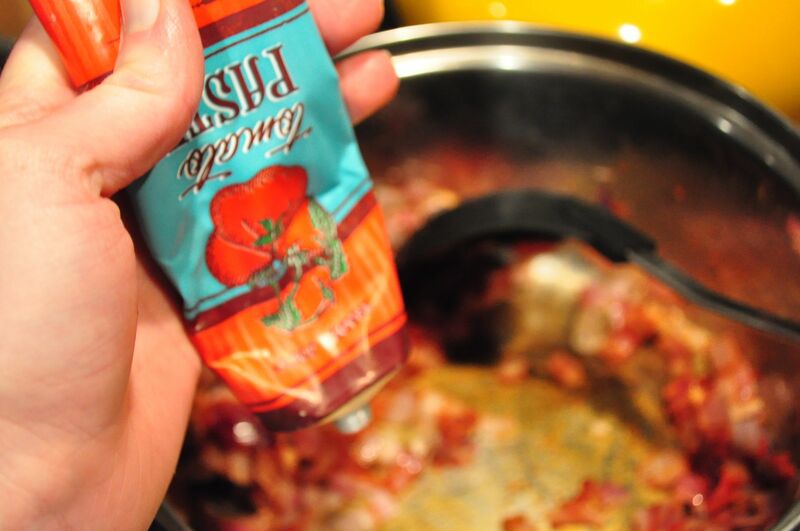 The recipe allowed me to use what may be a new favorite — the squeezable tube of tomato paste by Trader Joe’s. I usually hate using only part of the tomato paste can and having to store the rest, only to go forgotten in the fridge. But the tube! It’s a new favorite. Last night I was feeling extra lazy about cooking, my day sandwiched with teaching exercise classes at 9:30 and 5:30… and a gaggle of deadlines coming up. So I went with a recipe that would, A) help use another third of our 22-pound steal of pork shoulder from Costco (for about $1.50 a pound), and B) look like I had cooked all day without having to be in the kitchen. Pulled pork sandwiches it is! I used Simply Recipes’ recipe for pulled pork with, of course, a few substitutions (I ran out of ketchup, used a little BBQ sauce). I picked this recipe because it called for just under three hours of cooking. Most of the other pulled pork recipes called for almost a day in the crockpot, and I just never have the patience for that (I ate almost all of my crockpot applesauce before it was done). This recipe turned out great and we plan to take the extras to our friends with the new baby. 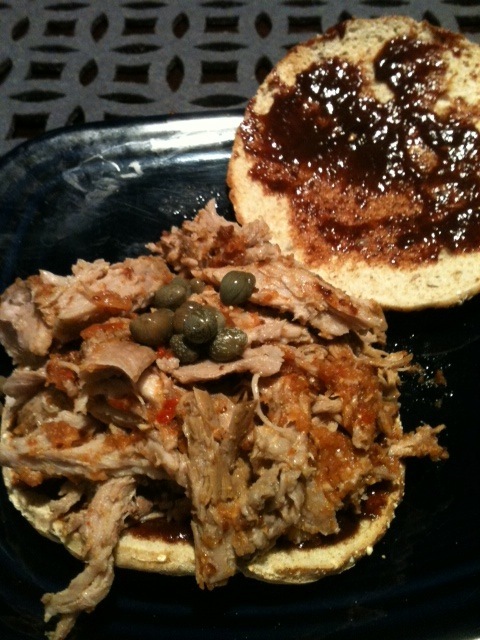 We topped the sandwiches with capers (out of pickles) and our favorite sauce from Pork Barrel BBQ, which has a location on the Del Ray strip of Alexandria (skip the pricey retro sodas and it’s not a bad deal). Never mind that I happened to pick up a case of the stomach flu last night… just after eating these delicious sandwiches. Needless to say I won’t be eating the leftovers. It’s Fresca and crackers for me today! Good thing I got all that cooking out of my system! I was going to ask you for the Shepherds Pie recipe after you IGed it! YUM!